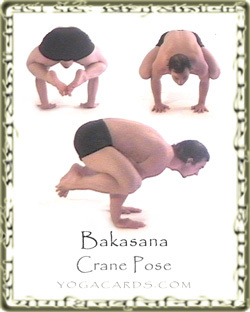 The Crane pose is one of the easiest arm balance postures to perform. Place the hands on the mat in front of you. Bend the elbows out a little and place the inside of the knees or upper thighs on top of the triceps (the outer upper arms). See a yoga video of this yoga position . Once the knees and legs are in place lean forward and slowly allow the feet to rise off the mat. Leaning forward too fast can injure the wrists because of the sudden weight and force that fall on the wrists. There is also a small chance that too much forward tilt will be applied and the face and upper body will collapse forward and down into the mat. Don’t let this put you of trying because its much worse when it happens from a handstand . This is a yoga posture that stretches the knees, hamstrings and lower back. Look at one point. It is always easier to maintain balance when the gaze is fixed. The easy version of this posture is shown on the right. The harder version with the arms straight is shown below. In the easier version the weights force is distributed more freely over the wrists. In the harder version you can see as slight tilt forward. This compresses the front of the wrists. For this reason many practitioners curl the finger slightly and engage many of the muscles in the forearms and wrists. This creates a little extra lift which reduces the compression on them. This is a great posture to introduce arm balances. The other is Astavakrasana.